1. Character Information : If the character has been captured the Master's information can be checked, if not the character's information (class, CP, Level) will be shown. 2. Count Information : Remaining counts for the rescue, duel, labor and revenge cooltime can be checked. The count is a daily count which resets at every 00:00. More details for the count are as follows. 3. 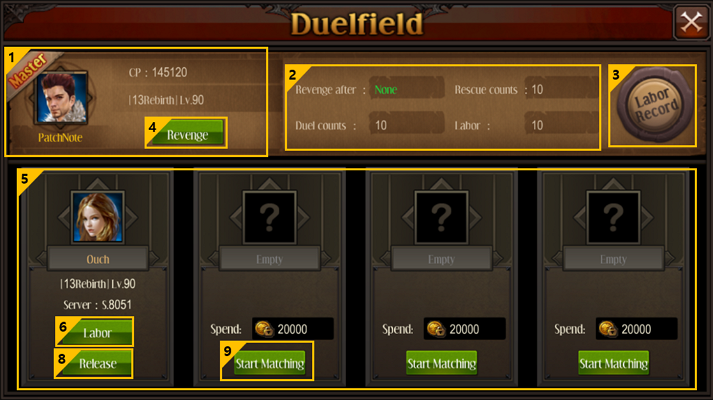 Labor Record : Can check play histories (battle records, labor rewards) for Duelfield. The 30 latest histories can be checked. 4. Revenge : The button shows up when the character is captured as a slave. Can have a revenge Duel with the master to set free. Can only be free by winning the Duel. And Revenge has cooltime of 10 min. 5. Slave : Can check the captured slave's information. Total 4 characters can be captured as a slave. 6. Labor : Can send captured slaves to labor and claim rewards. Both the master and slave can claim the rewards. 7. 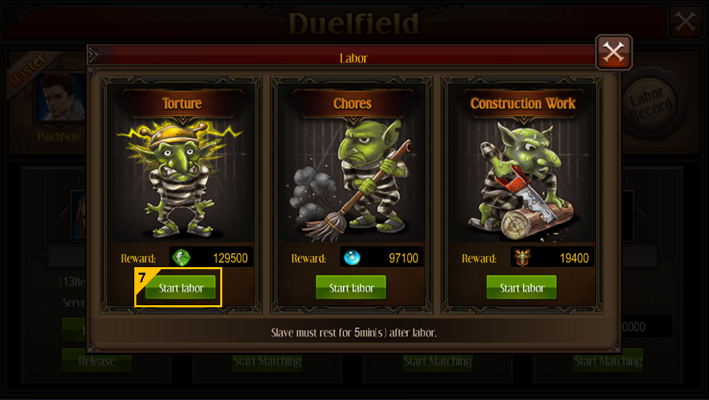 Start Labor : Can send slaves to one of the labors (torture, chores, construction work) by pressing 'Start Labor' button. Each labor has different rewards. The slave must rest for 5min after the labor. During the break time slaves can't be sent to labor. 8. Release : Can release the captured slaves by pressing 'Release' button. When the slave is released, the slave slot gets empty and can be filled with other slaves. 9. Start Matching : Can start the matching for the Duel by consuming 20,000 bound Zen. 1. Change : The matched character can be changed with 'Change' button. 2. Duel : Can proceed Duel with the matched character by pressing 'Duel' button. If the opponent is defeated and you won the Duel, the opponent is captured as a slave. ※ The matching is only available between the characters with same Rebirth. 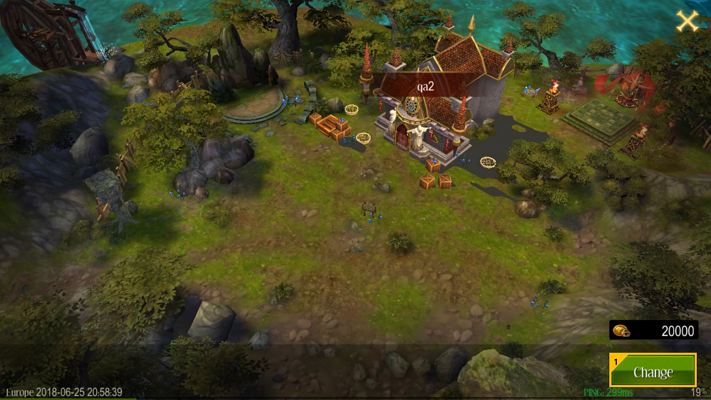 ※ Duelfield is available when Fortress in Domain is created. The Fortress is automatically created when [Domain > Fortress] is clicked. 1. 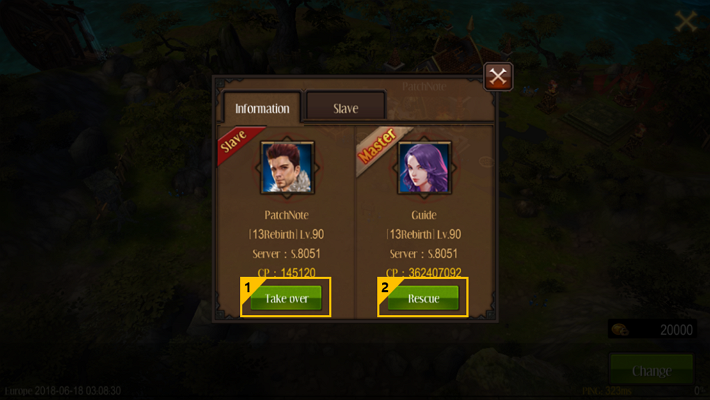 Take Over : If the matched character is already captured as a slave, 'Take Over' button appears. Pressing the button, the Duel begins with the matched character's master. If the master is defeated, the slave can be taken. 2. 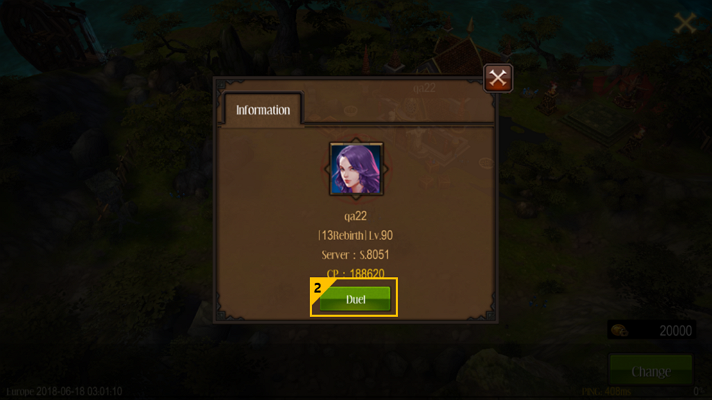 Rescue : If the Friend / Guild Member is captured as a slave, 'Rescue' button appears. Can rescue Friend / Guild Member by pressing 'Rescue' button and having Duel with the master. ※ To success Rescue / Revenge the Duel must be won.